What The Heck is “Lagom”? So let’s do this! How….how do we do this? So this lagom thing…I guess have to to start somewhere, right? In all the organizing/decluttering articles I’m always reading, they tend to recommend you start somewhere small – say one drawer in your desk, or one shelf in a cupboard. I was thinking about what to start with as I was heading out to run an errand, and as I picked up my purse, the answer instantly came to me. 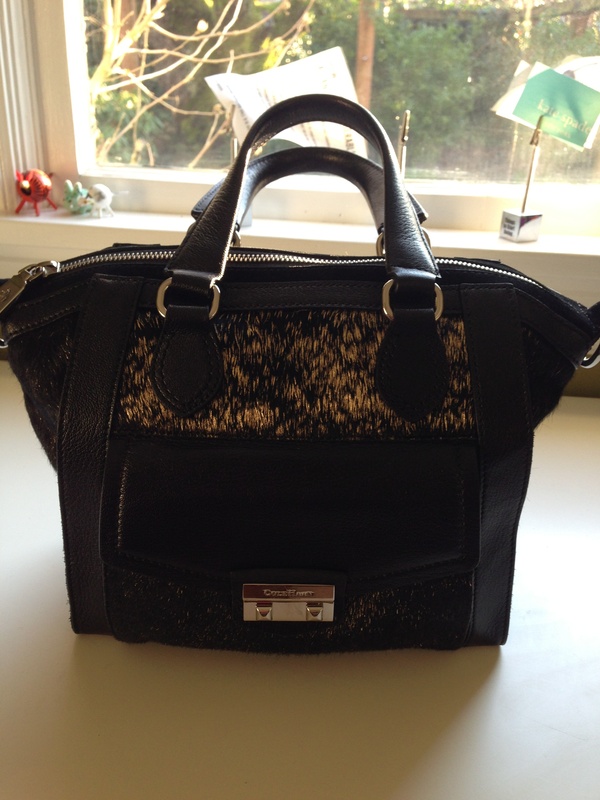 My purse. It’s a mess. A little trash can looped over my arm, impossible to find anything in without lots of rooting around or piling stuff up in an embarrassing heap next to it at the checkout. Why yes, I do have three glasses cases. Why? Well, the brown Coach case holds a pair of sunglasses that aren’t prescription, but I like the way they look. But I can’t drive without prescription lenses, so I can only wear the Coach sunglasses while walking around. 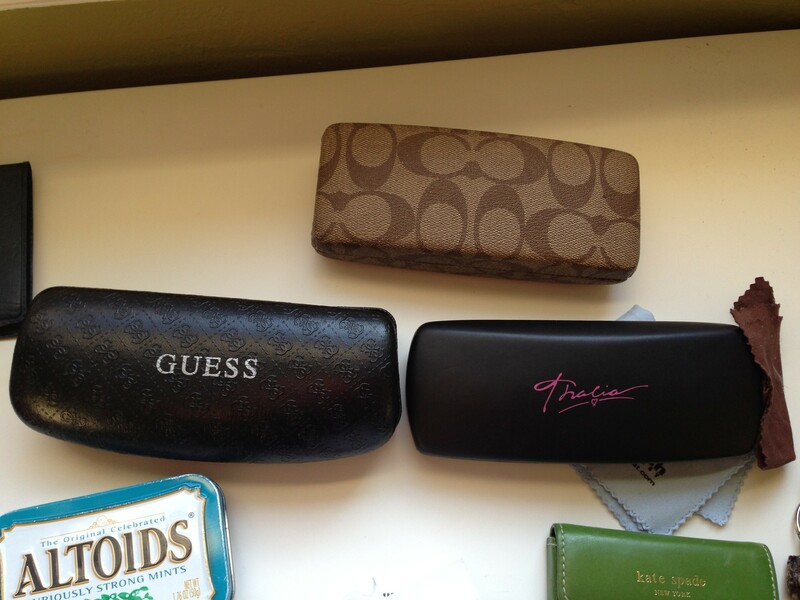 The ones in the Guess case are my prescription sunglasses, which work, but are pretty scratched up, and I’m not crazy about the style anymore. The other black case with the pink writing holds my regular glasses. And yes, I have two wallets. The black one is my regular wallet. 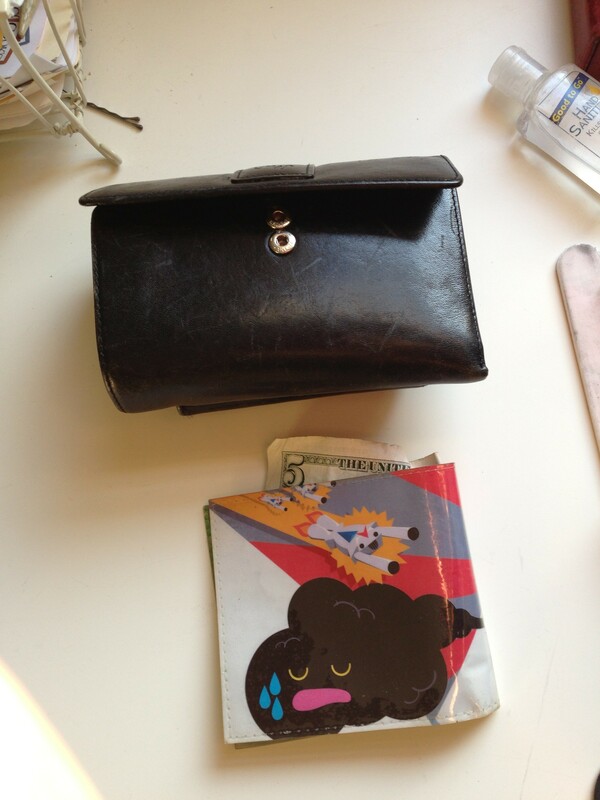 The smaller one with the cartoon image is what I use as a travel wallet – when I travel I just take my credit cards and some cash and leave all my store cards, insurance cards, etc. at home. 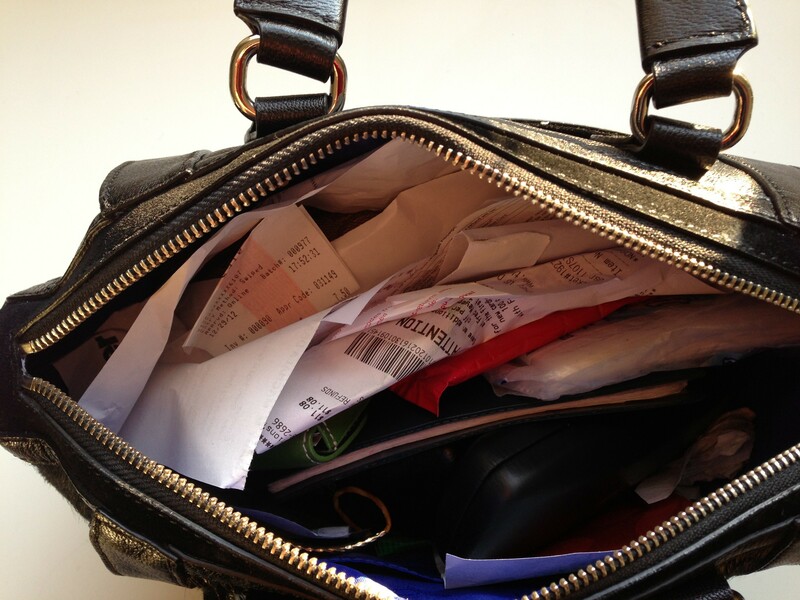 We got back from vacation on Christmas Eve, and I have yet to transfer the money and cards back to my regular wallet. Because I am lazy. And your eyes do not deceive you, that is a pile of trash I’ve been carting around. 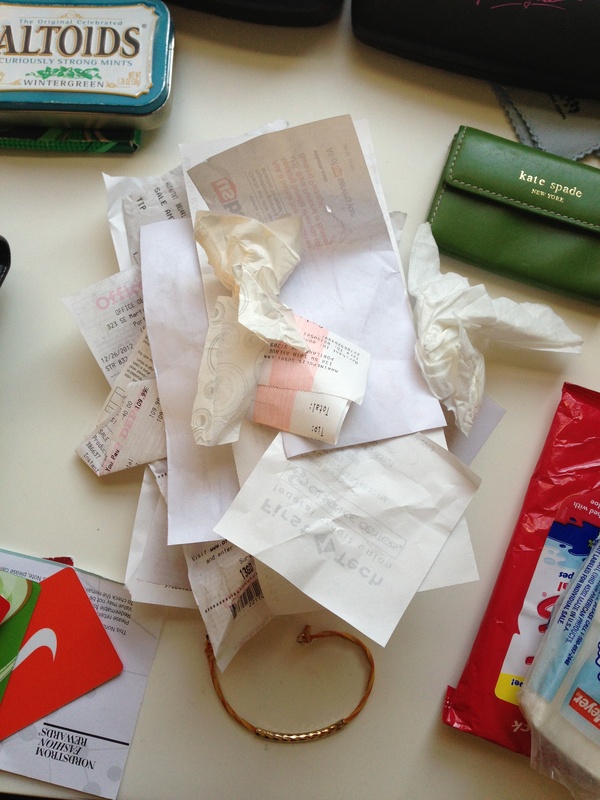 Old receipts (some which need to be tossed, some which need to be filed for tax purposes), banking slips, gum wrappers, check stubs, and yes, used kleenex. Disgusting. And definitely on the “too much” side of lagom. 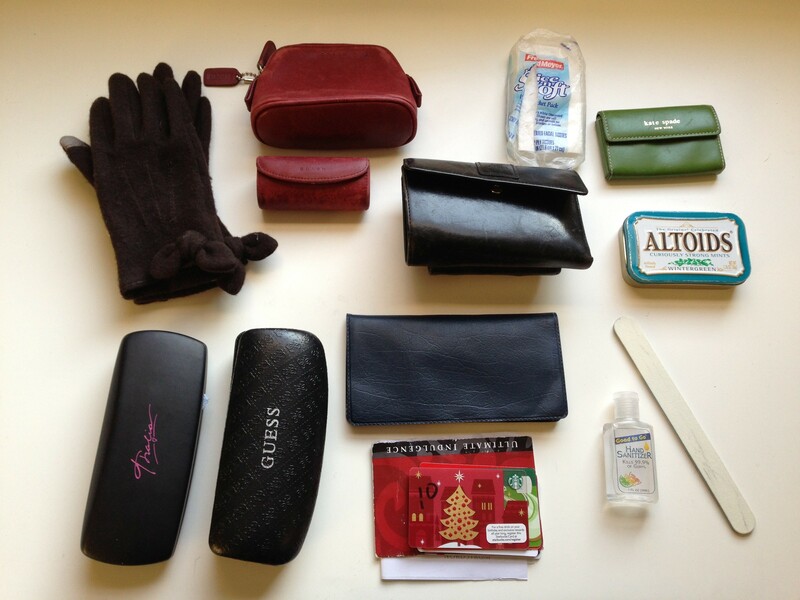 Transferred money and cards from travel wallet to regular wallet, and put travel wallet back with travel gear. My next goal, when I can afford it, will to be to buy a wallet that holds my checkbook too, so I won’t have two separate pieces. Removed non-prescription sunglasses. Vowed to get a new pair of prescription sunglasses in the same style as the ones I really like. 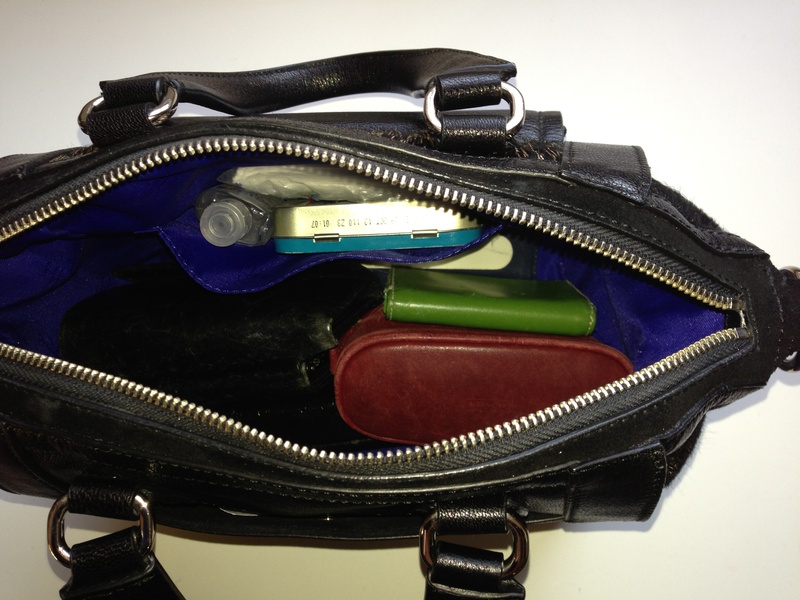 Pared down makeup to what would fit in makeup bag. I’ve still got the lipstick case, which I keep for the mirror, but think I will get a small mirror that can tuck into the makeup bag and then I can get rid of the case. Tossed the gum, but kept the mints. Both items achieve the same purpose. Do I really need both? Got rid of the lotion, kept the hand sanitizer. It is so rare that I actually use hand lotion when I am out and about. Hand sanitizer is a different story, especially in cold/flu season. Tossed the hand wipes – they pretty much do the same job as hand sanitizer. 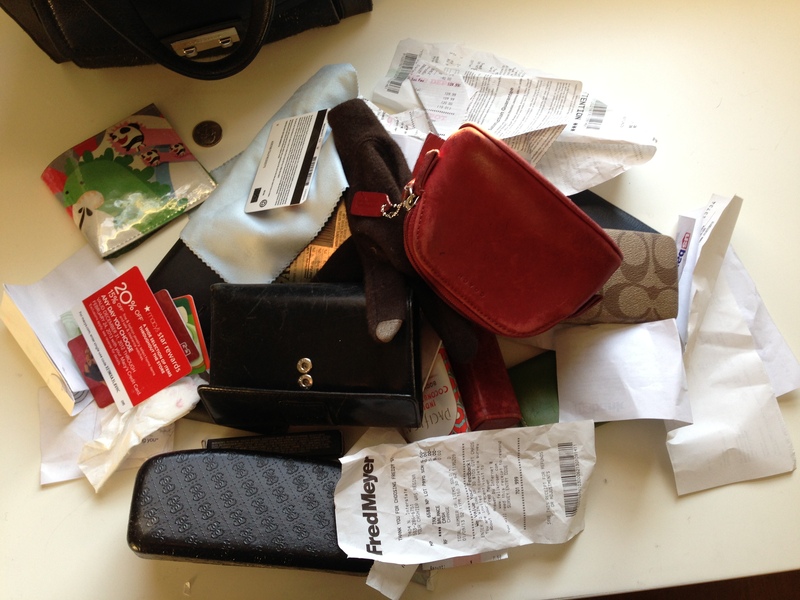 Removed stray bracelet, and pared down the gift cards and coupons to the ones I know for sure I will use. If it was a card with money on it, it stayed. All promotional cards and coupons were tossed, since I can’t afford to shop right now anyway. Now let’s see if I can keep it that way! 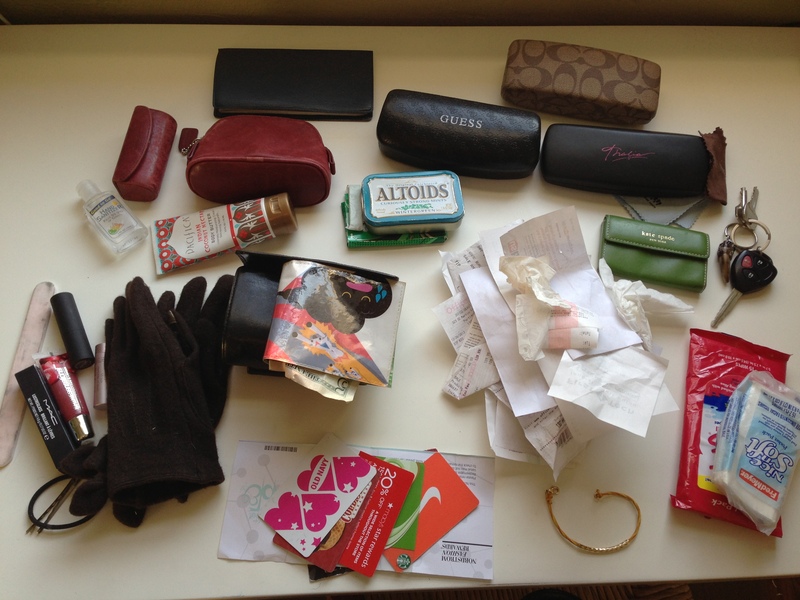 I’m curious – what’s in your bag? What can’t you live without? What is lagom for you in this area? Laura Faye Smith is a theatre, voice over, and commercial actress living in Portland, OR. She has a complicated relationship with her stuff. Blogs I Follow – Give Them A Try!